One of the various hill stations set up by the British to head to escape the heat of the plains, Dalhousie is probably one of India’s most well known holiday destinations. Dalhousie has been the vacation spot for tourists both locals and foreigners. As a matter of fact, it is the unofficial honeymoon mecca of India. Like the other hill towns, Dalhousie in the state of Himachal Pradesh, bears a name of historic significance. Located in the Chamba district of the state, Dalhousie has for long been in the shadows of its better known big brother – Shimla. The landscape of Dalhousie, built around five hills, is a feast for one's eyes. The pine clad place is a blaze of colour throughout the year thanks to the richness of its breathtaking flora. 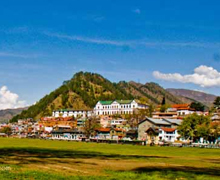 Dalhousie is the reminiscent of an English town, with colonial era buildings, churches. Named after Lord Dalhousie the British viceroy in India, it is located at an altitude of 1854.mts above sea level. Dalhousie is also becoming one of the homes for India’s outdoor adventure activities, including trekking, cycling and rock climbing. Churches: St. John’s Church at Gandhi Chowk, St. Francis’ Church at Subhash Chowk, St. Patrick’s Church at Balun and St. Andrew’s Church are famous churches in Dalhousie. Surrounded by tall pine trees, Jandhri Ghat, 2 km from Dalhousie, is a spectacular place and a top attraction. 3 Km from the town, Panjpulla, meaning five bridges, is a scenic spot with a pool and water flowing under five bridges presenting a beautiful spectacle. Here you will find the memorial of Sardar Ajeet Singh, a renowned freedom fighter. Located on the way to Panjpulla, the waterfall named Satdhara should be visited. The waters are believed to contain curative properties. Located at an elevation of 2440 metres, Kalatope Sanctuary is situated eight km from Dalhousie. Spread over an area of about 31 square kilometer, the sanctuary is home to the barking deer, black bear, serow, kalij and chir. The Kalatope Forest Rest House offers accommodation and other facilities for the visitors. For those with love for trekking, Kalatope offers some 4-5 kms of trek. Dainkund, 10 Km from Dalhousie, is the highest point in Dalhousie. This towering peak commands panoramic views of the Pir Panjal range and the rivers of Punjab. 1.5km away is located the Jai Pohlani Mata Temple. One of the must-visit places around Dalhousie, Khajjiar is a scenic grassy meadow surrounded by dense forests of deodars. 27 km from Dalhousie, the saucer shaped Khajjiar, often touted as a 'mini-Switzerland', is 1.5 Km long and 1 km wide. Devdar Hotel, Mini Swiss Hotel and Shining Star are some of the accommodation options at Khajjiar. 56 Km from Dalhousie, Chamba is known for its mesmerizing natural beauty, ancient shrines and palaces. Built in 10th century by Sahil Verman, Laxmi Narayan Temple is worth visiting. Chamundadevi Temple, Hari Rai Temple, Bajreshwari Temple Champavati Temple and Sui Mata Temple are other famous shrines of Chamba. St Andrews Church is another sacred place here. Bhuri Singh Museum, containing masterpieces of the Chamba, Kangra and Basholi schools of painting, is a favourite haunt of the tourists. Hotel Iravati, Hotel Champak, Hotel city Heart and Jimmy’s Inn are some of the places where the visitors can stay in their tour to Chamba. 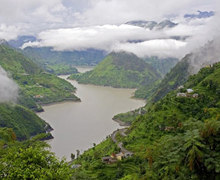 21 kms from Dalhousie, the Chamera reservoir or the Bhadrakali Lake as it is known has been created thanks to the Chamera Dam across the Ravi River. Boating facilities are available here. Accommodation in Dalhousie is not an issue for any travelers visiting this beautiful hill station. There is plenty of accommodation available ranging from luxurious hotels to budget hotels and rest hostels. There are several government approved accommodations that provide subsidized rate. Visitors are advised to book in advance during the peak season. If you plan a visit Dalhousie and enjoy the tour in the lap of luxury and comforts there are options to choose from luxurious hotels to budget hotels in Dalhousie. 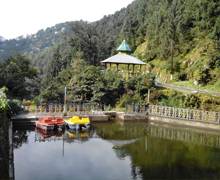 Accommodation in Dalhousie is very easy to acquire as the hill station is filled up with lots of resorts and hotels catering to the needs of everyone. The temperature in Dalhousie is cold throughout the year. It varies distinctly between areas and the greater the height, the lower the temperature. How to reach Dalhousie by Air: Various airlines have daily flights between different cities of India and Jammu Airport and Amritsar Airport that are 190km and 192 km away respectively from Dalhousie. How to reach Dalhousie by Road: It is also possible to reach Dalhousie by bus or car. Dalhousie is 563 km from the capital of India, Delhi and 353 km from Chandigarh, the capital of the states of Haryana and Punjab. Public buses, as well as the popular tourist buses, run both of these routes with stops. How to reach Dalhousie by Rail: Pathankot, in the Indian state of Punjab, is the nearest Railway Station closest to Dalhousie and is 80 km away from this hill station.